Huge, natural Baltic butterscotch amber pendant with Arts & Crafts sterling silver chain. The pendant measures 3 1/4" x 1 3/4" x 1 3/8" with out the bail. (4 3/8" with bail). The sterling silver chain is 22.5" long, it is marked 925 and two makers hallmarks. This amazing necklace is in excellent pre-owned condition. Weight is 62.2 grams. Very pretty, vintage, sterling silver and natural, butterscotch, egg yolk amber necklace. The chain is 20" long, silver and amber pendant measures 2 1/2" x 1". Condition of this necklace is excellent. Weight is 18.4 grams. Gorgeous, large, genuine salmon color coral brooch mounded in silver frame. 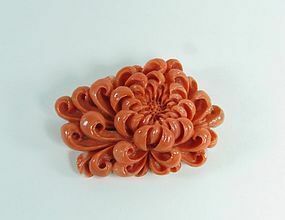 This beautiful chrysanthemum flower pin measure 2 1/2" x 1 3/4" x 5/8", (62mm x 44mm x 14mm. Carving of the coral and color is magnificent. Weight is substantial 43.8 grams. Frame is marked silver and makers mark (Chinese Characters). Coral is of the highest quality.